A cover crop is vegetation that is planted or managed for the purpose of improving a number of conditions associated with sustainable agriculture. Cover crops are fundamental tools that improve soils, crops, and water quality by reducing losses of nutrients, pesticides, or sediment from agricultural fields. Cover crops may be permanent, harvested, left as surface residue, or plowed under for use as a green manure. 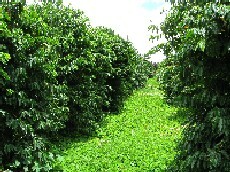 They can be planted for conservation measures including buffer strips, filter strips, grass hedges, and rotation crops. Some cover crops that have been utilized on the islands are sunn hemp, oats, buckwheat, and more! For more information on different cover crops, please check out the “Cover Crop Chart for Hawaii” link below. Additionally, if you are interested in ‘Tropic Sun’ Sunn Hemp seeds, O’ahu RC&D does sell them. To purchase, please visit our Sunn Hemp page! Improved Water Quality. Cover crops allow more rainfall to infiltrate into the soil, reducing run-off and increasing soil moisture available for crop use. Reduced run-off means less erosion and fewer nutrients and pesticides entering our streams. Soil Quality. Cover crops improve soil quality by protecting the soil surface from the impacts of sun, wind, and rain, and through the addition of organic matter to the soil. Weed Suppression. Weeds flourish on bare soil and cover crops take up space (and compete for light, moisture, and nutrients) reducing the opportunity for weeds to establish themselves. Some cover crops include natural plant toxins called Allelochemicals that further reduce weed growth. Pest Reduction. Cover crops can enhance a farm’s pest management program by encouraging beneficial insects – natural enemies of crop pests. The wide diversity of plant and animal life found in natural systems prevents serious pest outbreaks. Cover crops mimic this natural diversity and provide food and habitat for beneficial insects. Attracting Pollinators: Cover crops can attract beneficial pollinators to fields increasing pollination and increasing overall biodiversity. Economics. Cover crops save farmers money by reducing the need for fertilizers and pesticides. The increased available water and improved soil health also lead to higher yields.